A Chinese man who won a high profile auction for two bronze artworks claimed by China says he will not pay for them. The sculptures, which sold for 15m euros ($19m; £13m) each in Paris last week, were originally looted from Beijing in 1860. Cai Mingchao, who has identified himself as the bidder, is an adviser to China's National Treasures Fund, which seeks to retrieve looted treasures. He said his decision to bid for the bronzes had been a "patriotic" act. 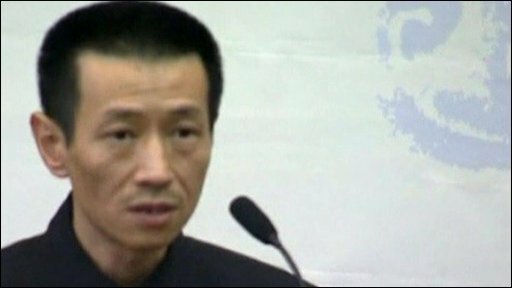 "What I want to stress is that this money cannot be paid," Mr Cai told a news conference. "I believe that any Chinese person would stand up at this time... I am making an effort to fulfil my own responsibilities," he said in a statement released by the fund. "But I must stress that this money should not be paid," he said. 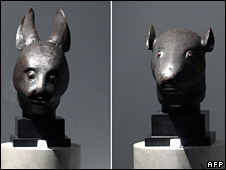 The two bronzes, in the shape of the heads of a rabbit and a rat, were auctioned by Christie's in Paris last week as part of the estate of the late French fashion designer Yves Saint Laurent and his partner. They were originally taken by British and French troops from the imperial Summer Palace in October 1860, towards the end of the Second Opium War. China had tried to stop the sale, and later threatened the business of Christie's in China for having gone ahead. But Christie's said the sale was legal, a position backed by a French court. The auction house said it was aware of the reports. "As a matter of policy, we do not comment on the identity of our consignors or buyers, nor do we comment or speculate on the next steps that we might take in this instance," it said in a statement. The statues were still in Paris, French news agency AFP said. According to Christie's conditions of sale, buyers have seven days to pay for their purchases. Yves Saint Laurent's partner, Pierre Berge, said that he would keep the items if Mr Cai did not pay up. "I'll keep them at my place," he told French radio. "We will continue to live together in my home." Correspondents say the sale has further soured relations between China and France, following a meeting between French President Nicolas Sarkozy and the Dalai Lama, Tibet's exiled Buddhist leader.